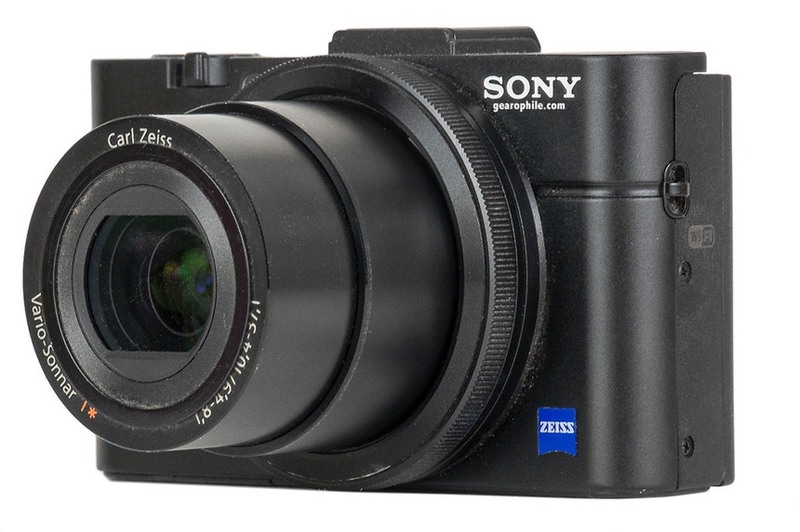 The RX100 is the original 1" sensor Cyber-shot compact camera from Sony, with the RX100II being a modest update. Both are available currently, so be careful to make sure you know which one you're getting and why. When I write "compact camera" I mean it. With their collapsing lenses, these two RX models are essentially shirt-pocket friendly cameras. They're just a little deeper than a true compact (the collapsing lens sticks out 10mm from the body), but not enough so as to be of concern. I've slipped my RX100's into shirt pockets, jacket pockets, vest pockets, pants pockets, and quite a few other pockets. It'd have to be a very small pocket for it not to fit. Within that small frame you have a very capable camera. The 20mp 1" sensor is bigger than the 1/2.3" or 2/3" sensors used by most rivals in the upper range of compacts. The collapsing lens is a 28-100mm (equivalent) f/1.9-4.9 Zeiss Vario-Sonnar design, and combines a moderate focal range with some attention to quality. The lens has a macro focus range down to about 2" (5cm). There's a pop-up flash, Mode dial, Fn button, a settings ring around the lens that can be configured, and the menu system is more like a good DSLR both in design and in options than it is compact camera. You can shoot raw files, and of course, there are video capability in both models. When I say "DSLR-like" in terms of the menus, you'll find things like changing aspect ratios (1:1, 4:3, 3:2, 16:9), setting fill flash and flash exposure compensation, bracketing, configurable self timer, auto HDR, and more. You can configure the control ring on the lens, the function button, the center button in the Direction pad, and both the left and right button of the Direction pad. You can make the Movie button only respond when you've set the camera to record video (on Mode dial) or have it as an instant movie option. There's manual focus assist, too. A good solid set of options overall. 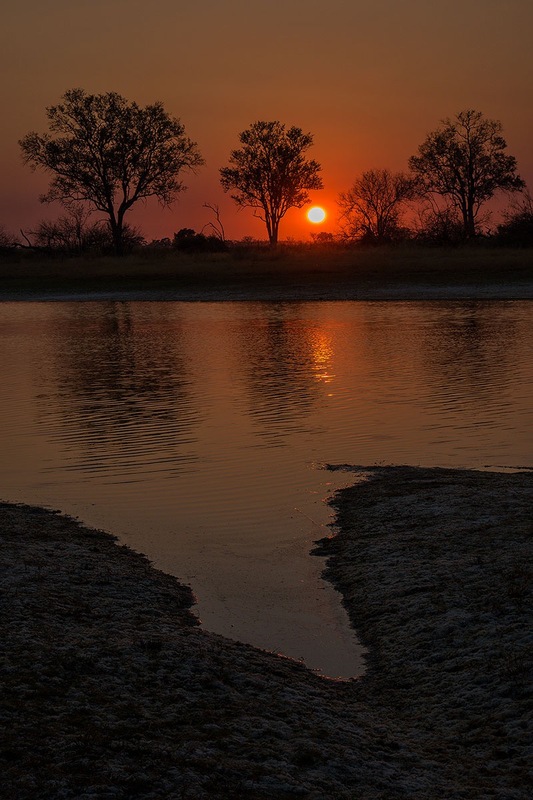 But there are some more consumer-like features in the camera, as well, such as a sweep panorama mode, Scene modes (including a useful Hand-held Twilight mode), and the requisite all-Auto mode (two of them, as a matter of fact). All this in a camera that's less than 10 ounces (281g). To a large degree, Sony has pulled off a minor miracle here, with lots of performance and capability in a very small package. The RX-100 models are an interesting mix. For the most part they operate like a compact camera, but one that has a lot of configurability, can present a huge amount of information to you about how it's set, and acts more like a DSLR once you get into the menus. Yes, the lens dial has a bit of lag to it when you set it to something that you might like a little more immediate (like zooming the lens or changing the aperture). Yes, the buttons are small and tough for someone with big fingers to get to sometimes (especially since many of them are either indented or flush with the camera surface). Yes, it's tough to handle the camera with gloves on. But none of these things really bother me on this pocket wonder. I'd rather have the camera small than Sony making it bigger to support more controls. The Mode dial can be dislodged in handling, but it's happened very few times to me. That's because it's well positioned and mostly recessed (doesn't stick out from the back). You really have to accidentally hit the top back edge of the Mode dial to move it, and even then it's fairly stiff and has click stops, so it takes a pretty strong blow to move it. When I got my RX-100 right after it came out, I worried a bit about the fragility of the controls. They seem like they might be flimsy. But in reality, they're turned out to be wonderfully resilient to the abuse I throw at this camera. My RX-100's have been to Africa, Alaska, and Europe, and all over the Americas. I haven't coddled them. Everything's holding up quite well and the precision and movement of all the controls are still as they were when I got the cameras. The RX-100II has some handling advantages over the original RX-100. The tilting LCD may not have a huge range of movement, but it's more than enough to make the camera more flexible in shooting. Ground level shots are simple enough, and the old camera-over-head-in-crowds operation works fine, too. But it's really the EVF that makes the new model shine. While the optional US$450 viewfinder is over half the cost of the camera alone, having one with you makes it so you can use the RX-100II in a much steadier shooting position. With a fast-refreshing 2.4m dots and a tilting eyecup, it's got good discrimination and can even be used for low angle shots due to the tilt ability. Don't think that you need the EVF for bright light, though. The LCD on the RX-100 models is decent for daylight work. The big liability in handling for both versions of the camera is the lack of grip. Shiny slippery, flat metal on the front. There's a simple solution, and it's from my friend Richard Franiec, whose products I've mentioned before. Just get his RX-100 grip (US$34.95 plus shipping). Don't forget to tell him I sent you, but you'll be glad I did. Why the camera companies can't do this themselves, I have no idea. Maybe the camera designers in Japan all have suction cups on their ends of their fingers. Whatever the reason, Sony has joined the many companies that have managed to get the grip wrong when the solution is so easy. So wrong, that they developed their own stick on grip for it, the US$15 AG-R1. It's cheaper than Franiec's, but not as elegant (plastic instead of high-grade, glass-bead blasted anodized aluminum). Other minor quibbles: the tripod socket is right against the battery compartment door and not centered with the lens. This means that those of us who use Arca-Swiss style plates on our camera gear have a difficult time finding something that works for the RX-100 models. Also, the neck strap rings are small and indented into the body. You can really only get those small thread-like loop connectors into this small space. That restricts the type of straps you can find that will work if you want to carry this as from your neck or get a wrist strap. Battery life: The little NP-BX1 batteries are rated at about 350 shots CIPA, and I've found that I can easily achieve that as long as I avoid much flash work and don't use the EVF option on the RX100II. With EVF, I've been down in the low 200's per battery charge. Without it, I've been over 400 a few times. The batteries are small and painless to carry extras of. Just buy a couple and keep them charged and you'll be happy for a full day's worth of extensive shooting. Write speed: Nothing particularly outstanding here, but nothing to get upset about, either. While Sony claims a 10 fps JPEG continuous shooting mode (5 fps if you add raw), that's with frozen metering and focusing from the first shot, and there's not a lot of buffer so you're going to hit the wall in a little over a second of doing that. Write speeds themselves seemed reasonably brisk with state-of-the-art cards. It's not a camera I want to be trying to shoot continuous raw with, but shooting single raw images over and over with only brief waits is not a problem with the RX-100 models. 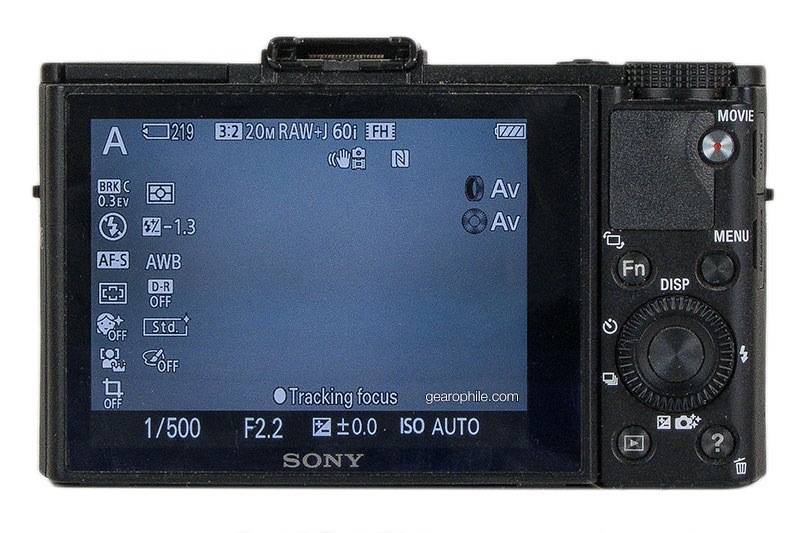 Focus: the RX-100 cameras are not DSLRs. Don't expect DSLR focus speeds (or continuous focus following performance, either). For static subjects, though, the RX-100 cameras seem fine. I'd characterize them as "fast compact cameras" in terms of focus, even in low light. It's rare that I'm upset with the single focus performance on the camera, and it can be somewhat snappy to focus in brighter light. I'd love to see what Nikon's phase detect on sensor focus system could do for this camera, though. That would make it more than just a good focus-once (Single Servo) camera, I think. Lens: a lot has been written by others of the lens performance of the RX-100 models. There's some chromatic aberration visible even in JPEGs, but not excessive. Indeed, for the size of the lens and the performance parameters of the lens, I was expecting far worse. You'll see purple spill in high contrast situations, especially at the wide end of the lens, but I've found it to be easily correctable in software, so I'm not overly concerned about that. Some of the complaints about softness of the lens aren't really the lens, I think. Sony's JPEG handling still has a bit too much heavy-handedness to it. Raw files can pull out more detail, and easily so. Yes, there's a touch of softness in the corners compared to the center, but that's a common trait for zooms that go wide. It really isn't enough of a problem for me to worry much about. Resolution: 20mp seems like a lot in a tiny camera. It is. Be careful not to think of it as 20mp. Between diffraction and other attributes, I'd say that the RX-100's shoot like a really great 12-14mp camera. If you try to push it as a 20mp camera and maybe even take that a bit further and try to get bigger than 18" prints with this camera, I think you'll be slightly disappointed. But certainly for smaller work you can do some impressive things with this camera. Noise: Okay, let's get JPEGs out of the way first. The RX-100 and RX-100II seem tuned differently. The RX-100 actually seems to show less noise in a similar shot, but looking closely I can see that this is more heavy handedness in the noise reduction being applied. By ISO 800 I think most people would see that the RX-100II pixels have a bit more integrity than the RX-100 ones. Others have reported a half stop difference between the two cameras, and I can't quibble with that. On the other hand I find the RX-100's noise more clumpy and digital-looking than the Nikon 1's, which surprised me at first, and then I remember that we're looking at 20mp versus 10 or 14mp. That's an ISO 3200 raw processed in ACR at 100%. I'm fighting a couple of things here. First, the lens is at f/4.9 when it matches my usual 70-85mm (equivalent) position. 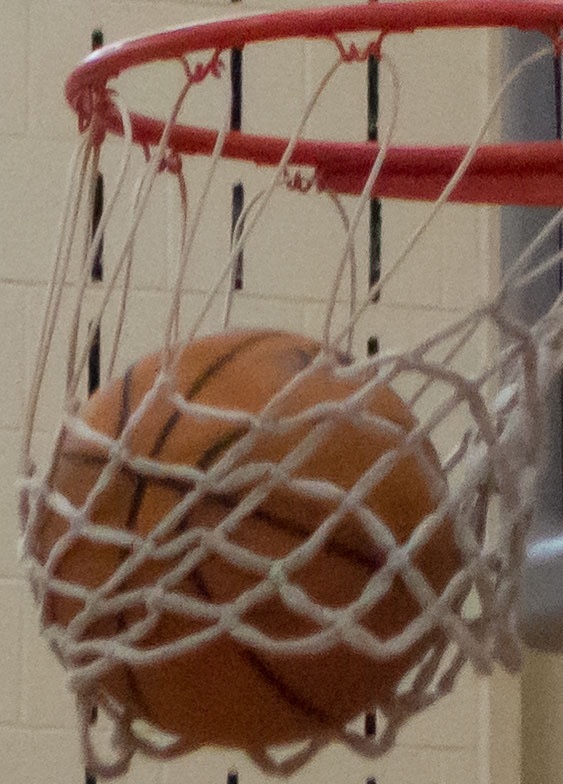 So we've got a little motion blur going on in the ball and net due to the slower-than usual shutter speed. But we're also getting more diffraction, too. As I noted above, it's probably better to think of the camera as being 12-14mp. We're trying to make it perform at 20mp here and it's struggling some. In terms of the noise, though, you'll notice it cleaned up reasonably well. To hold any edges I've had let some noise come into play. But we're also looking at a 441k pixel sample of a 20mp image. For a camera that fits in my shirt pocket, the RX-100II is doing just fine in this not overly bright gym. If you're looking for the best image quality you can produce from a shirt pocket camera that has a great deal of flexibility, then buy the RX-100. 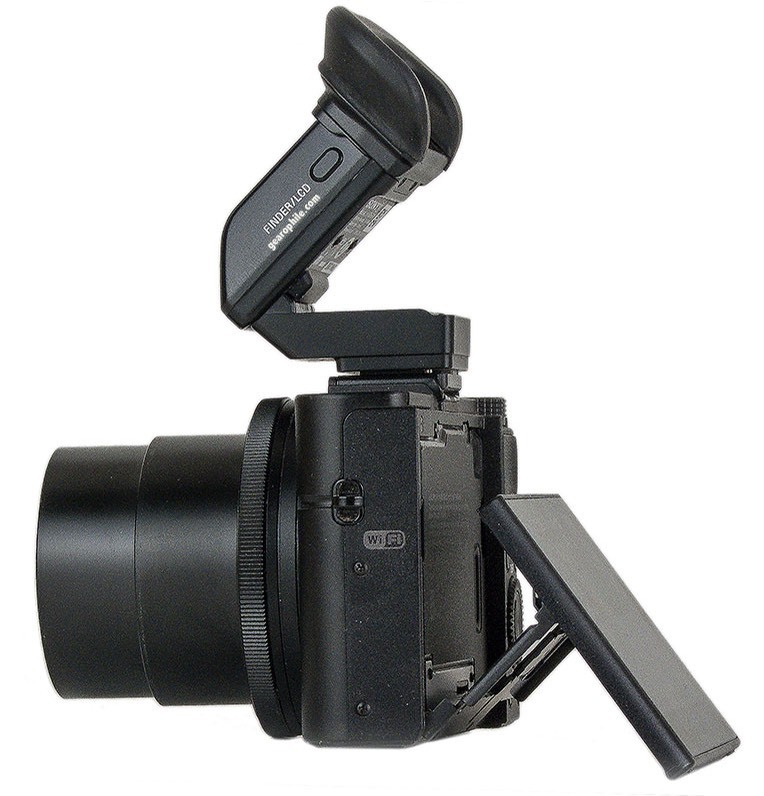 Or the RX-100II if you think the tilt LCD, WiFi, or EVF option will be useful. I've been carrying this camera around the world with me for over two years now. It's never disappointed me for compact-type camera usage. Never. That's saying a lot. The raw files the RX-100 produces aren't perfect, but they're very manageable, with nothing glaring that you can't fix with a decent conversion program these days. I didn't even bother to do lens corrections in the files shown in this review. So which one should you get? Right now the older model is US$150 less expensive than the newer model. At US$600 for the older model, it's getting down into "bargain" range, as far as I'm concerned, especially since many places are throwing in a few odds and ends, like a free SD card or case and maybe even some next order discount reward. Personally, I find the tilting LCD and ability to use the optional EVF enough of a case to pop for the newer RX-100II model, but when you add in the EVF you're now well over US$1000, so you really have to want this capability. Frankly, the half-stop or so difference in sensors really only shows up visibly at ISO values I rarely shoot at, so I don't judge that to be worth the extra money if that's the primary thing that you're debating about between the models.